22/6/12 - Acquisition - Amiens, Musée de Picardie - The Musée de Picardie has just purchased a family portrait by Eugène Giraud from Stéphane Grodée, an Amiens antique dealer ; it will join the collections on the first floor of this institution, currently closed for renovations until end 2013 (a subject we will soon discuss...). Produced in 1834, the same year Giraud traveled to Rome, this portrait is somewhat like a conversation piece : the painter set his models in a landscape and evokes their intimate ties through familiar gestures which animate the scene. The man on the left has placed his hand on the back of the woman sitting in the center of the group whose graceful pose can also be seen in the charming Portrait of Mademoiselle Bellet-Méhul from the Musée de Vendôme ; the young boy is nonchalantly leaning on his mother’s knee, while the other two figures have casually linked arms. 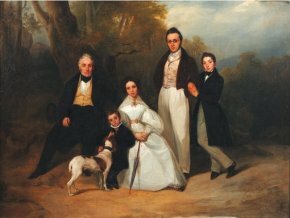 The family is shown sitting in the middle of a dirt path, against a backdrop evoking a dark forest and a cloudy sky, a landscape swiftly sketched in with Romantic overtones found also in the Portrait of Count Lancosme-Brèves et his Squires (1840) at the Musée de la Vie Romantique and where the artist chose the more solemn formula of an equestrian portrait. Eugène Giraud entered the Ecole des Beaux-Arts in Paris in 1821 where he was a student of Louis Hersent and Joseph Théodore Richomme before winning the Prix de Rome for engraving in 1826. He then exhibited portraits and genre scenes at the Salon between 1831 and 1866 ; some canvases were influenced by his trips, notably one he made to Spain in the company of Alexandre Dumas who was to narrate it in De Paris à Cadix. Giraud also produced some historical paintings, of lesser importance, such as Henri IV in the Tower at Saint-Germain des Près at the Château in Pau, as well as commissioned portraits. However, his reputation as an artist was established above all by his pastel likenesses, and resulted in his status as a portraitist among the nobility. The friendship and protection of Princess Mathilde also contributed to his success and made him one of the most sought after painters of the Second Empire, representing the Imperial Prince as well as the writer Gustave Flaubert.